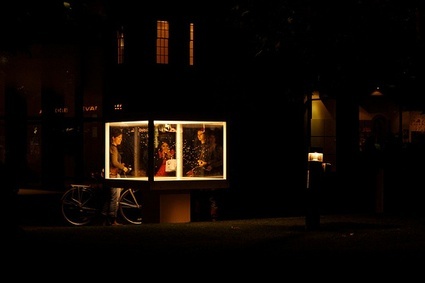 BEE BOX was curated by Howard Boland and Laura Cinti of C-LAB with the support of the European Public Art Centre, a collaboration between European organisations to exhibit in public space works that explore relations between art, science and society art-science artworks. The work was on view in Spitalfields, London and was recreated in Helsinki, using Finnish bees. The ‘BEE BOX’ reminds us of the invisible disappearances of our pollinators. Bees, like us, form communities of workers capable of generating intelligent social interactions. Brodie offers a poetic reflection on the fragility of these communities. 'In 2011 I was commissioned by C-Lab to create a European public artwork, and ‘Bee box’ was installed in Spitalfields, London, travelling to Helsinki. I have a beekeeper friend in the Scottish Hebrides who sent me hundreds of dead bees, drones that don’t survive the winter. 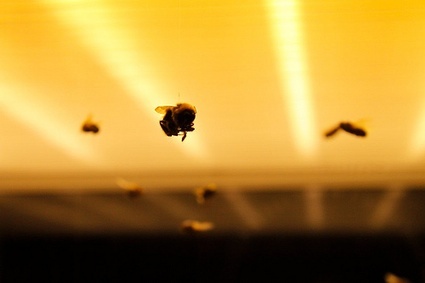 The dead bees were suspended inside a lit perspex box, flying nowhere, pollinating nothing. Timelapse film of C-Lab commission for European Art project. 2011. Bee box installed in Spitalfields, London and Lapalski Sq, Helsinki, Finland.